As the aging baby boomer generation grows, a growing number of Americans are projected to have dementia and associated cognitive decline. Currently over five million Americans are living with Alzheimer’s, a degenerative brain disease and the most common form of dementia. By 2050 that figure is expected to rise to 14 million, a staggering number of afflicted patients causing overwhelming strain on caregivers and the economy. Licensed naturopathic doctors (NDs) have effective approaches for the prevention of cognitive decline based on rigorous training in therapeutic nutrition, behavioral medicine, botanical medicine, and an emphasis on addressing the underlying causes of disease. Cognitive decline describes a noticeable and measurable impairment in cognitive abilities, including memory, language, thinking, and judgment. It is characterized by damage to brain cells, specifically, an accumulation of amyloid plaques and neurofibrillary tangles in the brain. This accumulation is influenced by a number of lifestyle, environmental, and genetic factors. Studies have suggested that one-third of dementia cases worldwide could potentially be prevented through better management of health and lifestyle factors. The biggest risk factors for dementia-related cognitive decline outside of age and family history/genetic pre-disposition are heart disease, diabetes, stroke, depression, and stress. Addressing chronic illnesses and lifestyle choices helps reduce the risk of developing dementia. 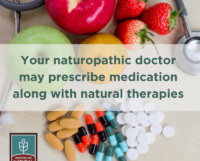 Prevention is a focal point of naturopathic medicine, and NDs have a proven track record of helping patients manage specific chronic health conditions such as heart disease, hypertension, and diabetes. NDs help prevent cognitive decline with therapeutic nutrition, behavioral medicine, botanical medicine, and an emphasis on addressing the underlying causes of disease. The role of exercise in prevention and slowing of cognitive decline is always part of the naturopathic medicine prescription. Naturopathic doctors spend extra time with patients and caregivers to find and tailor opportunities for physical activity. Studies confirm that obesity late in life is another risk factor for Alzheimer’s. Naturopathic doctors help address underlying metabolic imbalance to support long-term healthy weight maintenance. NDs assess and help optimize your diet to decrease inflammation and maintain blood sugar balance. Therapeutic nutrition through food and supplementation are often part of the plan. A number of herbal supplements including curcumin, resveratrol, and Bacopa monnieri have been shown to help reduce inflammation in the brain and support brain health. Studies show that insomnia and lack of sleep can increase the risk of Alzheimer’s. Additionally, medications often used to help with insomnia also increase the risk of cognitive decline. NDs are experts at resolving sleep issues using natural approaches such as herbal medicine, hydrotherapy, and blue-light blocking goggles. Treating the whole person, naturopathic doctors also educate and motivate patients to keep up ongoing social interaction, an important factor for both the prevention and slowing of dementia. Emerging research has identified hearing loss as a modifiable risk factor for dementia. Actively wearing aids, to help ease and encourage social interaction, has the potential to delay cognitive decline. You are more at risk for hearing loss if you have diabetes, heart disease, or if you smoke. Helping families create, access, and integrate cognitive exercises has also been shown to help prevent dementia. NDs can prescribe such programs, or refer you to and partner with, specialists in that field. Naturopathic doctors often recommend mindfulness meditation, and other forms of stress reduction such as gardening, journaling, and listening to music for the prevention of cognitive decline and to enhance memory and quality of life for those already diagnosed. It is important to remember that memory loss and cognitive decline can be symptoms of other disease processes or drug side effects and may be reversible. A proper diagnosis with a licensed provider is essential before beginning any kind of treatment with conventional and/or naturopathic medicine. Some commonly prescribed drugs create additional risk factors for dementia, such as proton pump inhibitors for gastroesophageal reflux (GERD). Naturopathic doctors address GI concerns with natural and lifestyle approaches. Research has also shown that long-term use of Zolpidem (Ambien) one of the most commonly prescribed medications for sleep, is associated with an increased risk of Alzheimer’s. While there are no known cures for Alzheimer’s and other forms of dementia, naturopathic medicine offers highly individualized, whole-person prevention strategies. A service for consumers from the American Association of Naturopathic Physicians (AANP) and the Institute for Natural Medicine (INM). INM and AANP would like to acknowledge Doni Wilson, ND, Sara Thyr, ND, and Amy Rothenberg, ND, for their contributions to the content of this FAQ. 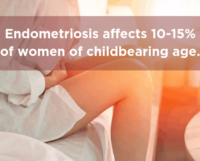 How Do Naturopathic Doctors Treat Endometriosis? 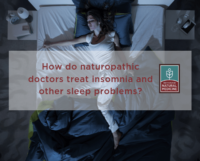 How do naturopathic doctors treat insomnia and other sleep problems? Do naturopathic doctors prescribe medication?